JLS is highly capable of producing precision tungsten carbide punches, buttons and bushings, ejector pins, mold components according to your specific CAD drawing. Our certified raw material is imported from reputable companies CB-CERATIZIT, Kennametal, or other specified. Tungsten carbide is of excellent toughness, wear&corrosion resistance. The increased life of Super-hard tungsten carbide can offer greater productivity through improved performance. Our products reach extremely close tolerances up to 0.001mm through continuous efforts over past 20 years. Moreover, inner hole surface and outside surface can be processed with mirror surface grinding. TiN, TiCN, TiALN coating and PG grinding can be processed with tungsten and fine polishing before coating and after coating is available. we are able to manufacture non-standard carbide punches&bushings and standard wear parts according to Misumi, Punch, Din, Dayton and other standards. TiN, TiCN, TiALN coating, mirror surface grinding can be processed according to demands. It is our commitment to make your tool long-lasting and no added costs. JLS is capable of making precision ceramic parts according to your drawing. our ‘know-how’ personnel are continually developing customized products to meet customers'evolving needs. We supply a variety of positioning components made to customers'design for injection molding industry, including tapered block set, tapered pin set, straight block sets, locking block set, slide block set, locating block set etc. TiN, TiCN, TiALN coating can be processed according to demands. How to make a deal with us? 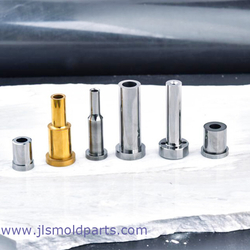 JLS wear components are widely serving for metal stamping production/fabrication companies, custom metal fabrication, injection mold industry,plastic mold/die makers, metal mold/die makers, tool and die maker, tool design& die making industries. JLS purchase material from reputable companies with material proof provided. You may check the material proof sheet on this website or ask us to send latest versions. 100% INSPECTION is conducted to make sure every piece of products is perfect when delivery to customers. Our inspection facilities include Easson profile projector, Digimicro stand, MMD100B, slide calliper rule etc. Packaging Detail : Anti-shock foam film and plastic box. Delivery Detail : Within 3-15 working days depend on the specification of carbide punch & die.